In action movie annals, few compare with this full-throttle epic of speed and carnage that rockets you into a dreamlike landscape where the post-nuclear future meets the mythological past. More simply, it's also one of the most mind-blowing stunt movies ever made. Under the direction of George Miller (Babe, Happy Feet), Mel Gibson first made his mark on movie history as heroic loner Max, who drives the roads of outback Australia in an u.. In the annals of action movies few can compare with Mad Max The Road Warrior, a full-throttle epic of speed and carnage that rockets you into a dreamlike landscape where the postnuclear future meets the mythological past. More simply, it’s also one of the most mind-blowing stunt movies ever made. Max is the heroic loner who drives the roads of outback Australia in an unending search for gasoline. Arrayed against him and the other scragg..
Two men enter. One man leaves. That's the law in Bartertown's Thunderdome arena. But lawnmaker Aunty Entity will soon add another: Don't get Max mad! Mad Max Beyond Thunderdome stars Mel Gibson (Lethal Weapon, Maverick) for his third go-round as the titular hero who takes on the barbarians of the post-nuclear future - and this time becomes the saviour of a tribe of lost children. Music superstar Tina Turner steals what's left of the scr.. Mastermind director George Miller's post-apocalyptic epics come together in this collection featuring all four legendary Mad Max films plus a new bonus DVD. Mad Max: Fury Road reboots the high-octane franchise, starring Tom Hardy in the titular role. In Mad Max, the first film of the series, we are introduced to Max Rockatansky, a force of vengeance roaming the wasteland that was the Australian outback. Follow it up with The Road Warrio..
All four movies from the action film series directed by George Miller. 'Mad Max' (1979), set sometime after an apocalyptic war, depicts a world in which the police have their hands full fighting roving motorcycle gangs. When the wife and child of cop Max (Mel Gibson) are murdered by one of the gangs, he sets out to get revenge. In 'Mad Max 2' (1981), following the road-side slaughter of his family, ex-cop Max roams the post-apocalyptic .. In the ravaged near future, a savage motorcycle gang rules the road. Terrorising innocent civilians while tearing up the streets, the ruthless gang laughs in the face of a police force bent on stopping them. But they underestimate one officer: Max Rockatansky (Mel Gibson). And when the bikers brutalise Max's best friend and family, they send him into a mad frenzy that leaves him with only one thing left in the world to live for - reveng..
"Who are they?" asks the burly leader of a pack of motorcycle savages. Before the dust settles and the last piston throbs, he'll especially know who one of them is. So will movie fans. Mel Gibson gave notice that he was a name to reckon with in the revved-up, trend-setting first of Gibson's Mad Max collaborations with filmmaker George Miller. Gibson portrays Max Rockansky, the fearless, leather-suited cop waging war with kill-crazy bike..
Now not only can you see the Academy Award-winning Mad Max: Fury Road in its original theatrical version, you can also see Mad Max Fury Road: Black & Chrome Edition, in visually stunning black and white! Compare and contrast all the intensity and grit of both versions of the film in this 2-disc Blu-ray set and discover why mastermind director George Miller calls Black & Chrome, "The best version of the movie. "Special Features All-New ..
Director George Miller, originator of the post-apocalyptic genre and mastermind behind the legendary Mad Max franchise, returns to the world of the Road Warrior. 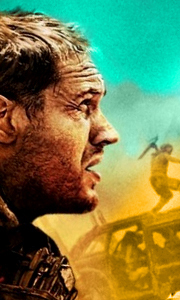 Haunted by his turbulent past, Max Rockatansky (Tom Hardy) wanders alone until he's swept up with a group, led by Imperator Furiosa (Charlize Theron) fleeing across the Wasteland. In hot pursuit, a warlord who gathers his gangs and pursues the rebels ruthlessly, leading a high-..